The Marketplace Feedback forum was created to allow members to review and post feedback about their experience with buying, selling, or trading with members in The Marketplace and with Industry Professionals in our Makers and Manufacturers forums. Buying and selling over the Internet requires a bit of faith. This is especially true when dealing with individuals because it requires trust. The new tools I'm launching today are designed to help members evaluate and build trusting relationships with other members and industry pros by providing a feedback profile and a Feedback Score. Feedback Scores are calculated based on feedback given by other members. This feedback may consist of positive, neutral, or negative ratings that are combined to form a Feedback Score. This score is an indicator of how positive a member's history of transactions has been. 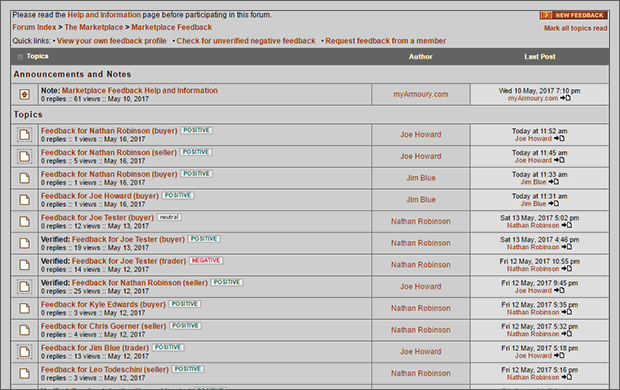 Feedback Scores are shown on member profile pages as well as below member names in all Marketplace, Makers and Manufacturers, and Marketplace Feedback forum topics. A list of feedback topics is shown along with their positive, neutral, or negative ratings. New links are at the top of the forum with feedback-specific functions. Posting new feedback is done by selecting the button. Feedback can be verified by its recipient to acknowledge that it has been seen and the transaction actually took place. The feedback profile shows an account of a member's transaction history and other details helpful in determining if a member can be trusted in future transactions. All received feedback can be browsed here along with feedback given to others. Also shown is how many separate individuals are responsible for leaving the feedback. Information such as the member's join date, number of posts contributed on our forums, and location (when available) are also included and should be considered when evaluating a member. This tool allows members to send a message asking for feedback on previous transactions. Providing the person's name, the type of transaction, and a short description will send a private message requesting they post feedback for you. Members who have unverified negative feedback as a seller or trader must verify that it's been seen before being able to post new topics in The Marketplace. A tool is provided to check and verify such feedback. More details and instructions can be found in the Marketplace Feedback Help and Information page. There's bound to be some bugs. I'll try to fix them as they come up. That all looks great Nathan and will give us all some extra security and faith, but also I would like to add a big thanks to you for making such an effort and putting in the time on behalf of us all. Wow that's a really smooth set up. Thanks for taking the time to put it in. I like the Respond button in the Request messages, that makes it really easy. Those tester messages are gold. I like the monkey and the diamonds the best. San Francisco has some strange myArmoury transactions going on. One thing: Seems like you have the subforum enabled to post replies to feedback. Not sure if you will want this as it could clutter up with replies to other replies, or worse yet, put a place on public for arguments. Might take a while to see how it goes. I like that this forum does NOT allow anyone besides the OP to reply to their listings. It keeps it clean and focused and all questions can be done through PM. That might be a good idea for this subforum. Unless I'm missing something, because I just started to check out the process. Well thanks again for the well-designed feature and the consideration you put into it for all the members! Took me a few reads to get what you're saying, but I think we're on the same page. I'm still waiting on my diamonds! Does this mean it is acceptable to ask questions in the new marketplace feedback forum? I really have missed the response ability in the Marketplace forum.. both as a buyer and seller.. on the buyer's end, f.e. about a week or two ago someone was selling tapestries but hadn't mentioned the size. I didn't feel like messaging the seller as I felt very strange if in the end I didn't buy them, which I wouldn't if they were indeed too small/large, in the end someone else bought them. On the seller's end, it would be easier to answer these kind of questions (weight, length, colour, etc) by posting a response, instead of individually replying to 10+ queries. In anycase, this new feature looks well integrated, good work! Does this mean it is acceptable to ask questions in the new marketplace feedback forum? You'd only ask/talk about the feedback itself.... not about things posted in the Marketplace. The Marketplace is a whole other forum. People won't have posted feedback until a transaction already took place so there'd be way to post a question about an active listing there, anyway. I really have missed the response ability in the Marketplace forum.. both as a buyer and seller.. on the buyer's end, f.e. about a week or two ago someone was selling tapestries but hadn't mentioned the size. I didn't feel like messaging the seller as I felt very strange if in the end I didn't buy them, which I wouldn't if they were indeed too small/large, in the end someone else bought them. On the seller's end, it would be easier to answer these kind of questions (weight, length, colour, etc) by posting a response, instead of individually replying to 10+ queries. Topic starters (for sale, wanted, whatever) have always had the ability to respond in The Marketplace to their own topics. For others, that's what private messages are for. If you have a question, why feel weird about PMing the topic author/person posting the listing? This is what happens on eBay, Etsy, etc. As for sellers, if somebody asks them a question in PM, they can always update their listing by adding an additional post with the new info. Again, this is like eBay, etc. with their "revised listings". It all sounds great Nathan. I didn't know whether you intended the different Reply policy for the two forums. But your last two posts here clear it up for me. Glad you are keeping the Marketplace forum focused, and if you want to enable discussion in the new Marketplace Feedback forum, it's nice you are giving people the opportunity to respond and discuss. Actually, now that I think of it, that's a good policy...if I had a negative feedback I'd probably like to contest or discuss it. I have a very low post count, mostly because I usually have nothing substantive to offer on any of the subjects that interest me (don't judge, I'm learning!). However, I've been a member of the forums for years, and during that time have made a couple purchases from members who've posted listings in the Marketplace. These transactions have all been via PM. When I attempt to create new feedback topics for these (positive!) transactions, I'm told I am too new to contribute and should increase my participation elsewhere before being able to post feedback. But as I have neither a useful background from which to draw meaningful material for participation, nor a propensity to respond to topics with "He makes a good point, Jim" to inflate my numbers cheaply, this is not likely to happen soon. Fantastic point. I hear you and I understand it must be frustrating. I've limited the posting of new feedback of any kind to people who have been a member for a short time. I'm not going to say what this limit is, but it's not very long. I've also put a limit on people with very, very low post counts. I'm not going to identify this limit publicly, but again, it's not very high at all. The irony here that is not lost on me is that posting feedback would actually increase a person's post count! ugh. Imagine a fraudulent person making an account with the intent to offer things for sale with no intention of delivering. That person might not get a lot of interest because he has no Feedback Score. So now this person creates a few different fake accounts and posts positive feedback for the main account. Now his main account has a positive Feedback Score and looks like there's been real transactions going on. This could all happen very quickly. I put the limits in place to give me and the moderating team time to actually see this sort of activity, evaluate it, and catch it before it gets to be a problem. Having the limits doesn't solve the problem, but gives us time and information needed to moderate this sort of thing. I realize this is going to affect a small number of members like yourself, but I think the net result of providing good information to prevent possible fraud really wins out here. So what's the upshot? Well, I'd encourage you to participate on the forum more. This could be in many ways and doesn't have to be giant, scholarly offerings. It can also include requesting feedback from those that you purchased from. Once that's given, you can type a thank you or follow-up note to the feedback resulting in another new post. I am admittedly a bit gunshy of fraudulent stuff right now and am really trying to find a good balancing point between all this stuff. I absolutely understand the need to prevent fraudulent/abusive/self-aggrandizing misuse, and only wanted to illustrate the experience from the perspective of a "noob." It's worth spending so much time here (even if it's just lurking for seven years) because of the positive reputation of the community. Maintaining and enhancing that, without stifling members' ability to interact, is definitely worth a little inconvenience (AKA incentive to more actively engage). One of my first experiences with myArmoury was purchasing my second "real" sword, and the first one that I was happy with. Choosing to trust a member, whom I knew only from watching a few forum interactions, with months' worth of my savings was agonizing. And I'm sure I didn't exactly inspire confidence, as a new member with just a single post, uncomfortable/unfamiliar with the buying process and no knowledge of the reputation of the seller, particularly since so many transaction methods can easily be abused in favor of the buyer. Ultimately we each chose to take the risk of trusting each other, and it worked out well for both of us. I know I would have been much more comfortable had something like the Marketplace Feedback feature been available at the time so this will definitely be useful in the future.Thank you for being so invested in fostering a healthy top-notch community! I would be in a very similar position myself, thanks for raising this. This was a message I sent that is a synopsis of a bad situation that took place several years ago ... I have written it off but this topic provides a forum where others might be warned against doing business with this person . Please see below . Christmas is coming and I would ask you to please do the right thing and refund my money . My contact info is below - PLEASE respond.